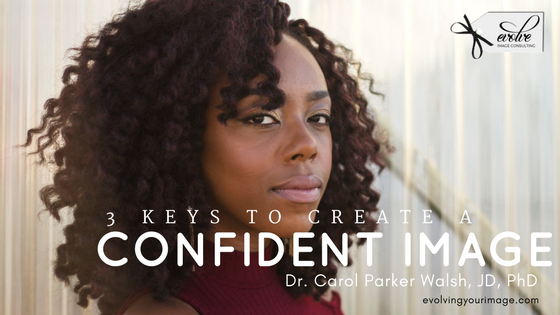 Dr. Carol Parker Walsh, Award-winning best-selling author, speaker, image strategist & consultant helping high-achieving women create a captivating presence & authentic visual brand. I had the recent pleasure of appearing again on our local morning show ABC KATUs AM Northwest (watch the segment here) and this time the topic of conversation was creating a confident image. As an image consultant I work with entrepreneurs, executives, retirees, and women of influence who want to up level their image and find a way to dress in a way that authentically represents who they are. While initially my clients fully expect me to reenact an episode of What Not to Wear, they become a bit surprised but appreciative that we begin our work with a focus on who they are and what they want. Shocking I know, but it’s the only way to truly understand what will work best on you. If you really want to build a wardrobe that makes you giddy every morning when you get dress, that make heads turn when you walk in a room, and gives you the confident to go after your dreams and achieve your goals is to follow these three important steps. I came up with the Style D.N.A.™ to help my clients understand the importance of using what’s in front of them as the foundation of their palette. The Style D.N.A.™ consists of your Distinguishable Natural Attributes which includes your body harmony colors, your body shape, your voice (tone, pace, pitch), and your body movements. Each of these attributes will help you determine the right colors you should wear, the type and weight of fabric that’s best, pattern sizes, and the appropriate line and silhouette that best accents your body. In truth, you already hold the keys to everything you need to know to create that confident image. You just need to the road map to get you there. That’s what I provide for my clients; the decoder to their personal D.N.A. Each of us have certain character traits that make us more amenable to a particular look or style. Whether creative and eclectic, sporty and casual, dramatic and alluring, traditional and practical, or polished and refined there’s a look, a style, a brand, and a style story that draws us in. Each of these style stories has an elemental energy that resonates with the one wearing it. When you are aligned to your elemental energy you feel confident, capable, captivating, and in command. Do some digging in your closet and ask yourself what statement are you making with what’s in there. Also, ask if it’s the statement you want to be making. What inspires you? What do you love? Which pieces make you feel amazing? These are clues that will give you vital information to tell your elemental energy style story. ::What are the outcomes I want to achieve this year? ::What actions do I need to engage in? ::Where and how do I need to show up? You’ll make mindful clothing choices knowing the answers to these core questions and ultimately create a balanced and harmonious wardrobe. While this may seem like a lot of work in the end it will be well worth it. You’ll save a considerable amount of time and frustration getting dressed in the morning because everything in your closet will make sense and have a purpose. You also won’t feel a need to make random impulse purposes and feel great wearing and re-wearing the wonderful selections in your closet. Ultimately you’ll have an image that reflects who you are authentically and confidently. Now when people say, “Wow you look amazing!”, it won’t be because they are shocked by your uncommon appearance. Instead it will be because they admire how fabulous you look all the time. Dr. Carol Parker Walsh, JD, PhD, FFSM, CIC is an award-winning two-time best selling author, international speaker, columnist, tv personality, executive coach and image strategist. Contact her at Evolve Image Consulting, LLC. for a complimentary discovery call. Follow her on Instagram and Facebook.